Love these dishes,some were broken when they arrived,but Overstock replaced them immediately. Give your dinner table an earthy touch with the Pfaltzgraff Everyday Cambria dining set. 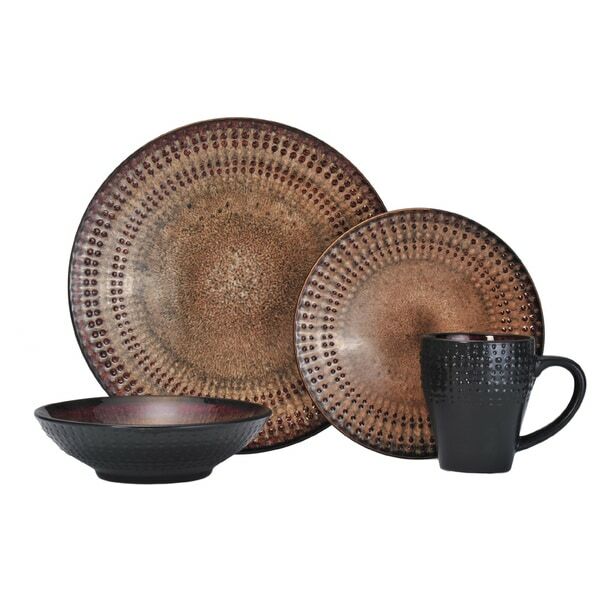 This 16-piece dinnerware collection includes dinner plates, salad plates, soup bowls, and mugs for up to four people, and incorporates rich brown and tan tones that pair perfectly with both rustic and contemporary decor. The embossed beadwork adds a touch of sophisticated character and texture to any dining table. These are gorgeous and seem very well made. I was a little worried about what condition they might be in when I found that the delivery driver left the box upside down on my doorstep and the only "fragile" sticker had been covered by the invoice label -- but they were very well packed and protected and nothing was broken. There are some minor chips/imperfections on a few of the dishes that look like it probably happened in manufacturing, which is why I'm giving 4 stars. Not worth the trouble of sending back. As stated in the description, the colors can be slightly different within the same set due to the nature of the ceramic firing. In the pictures these look like they have a more red/copper color to them - I found mine to be more gold with brown and some deep greens - the red is mostly in the dot pattern around the plates. At least it's that way in the set I received. I bought this set as a 48th birthday present for myself, which was March 3, 2017 replacing my FIRST set of Pfaltzgraff dishes, which was a 'moving out of the house' present at 18 in 1987. The first 2 sets arrived and I truly love this set and had been searching for the last couple of years for the 'right set'. I was dismayed when the dinner plates started splitting in half and realized the packing could have caused this flaw in the dinner plates (plates are packed so they are standing on the side of the box intead of being on the bottom- laying flat--aka horizontal verses being packed vertical). So, from the first 8 dinner plates I had 4 left and decided to buy another set, which came. Again the dinner plates kept splitting down the middle, then I called OS and was quickly shipped another box as a courtesy and now I have 16 mugs, 16 salad plates, 16 bowls and only 3 remaining dinner plates- I lost 2 more this week, one on Sunday 04.30.2017, when I was heating up my lunch and while getting my plate, half of the plate with the food all over the microwave and the other in my hand and tonight, I was getting the table set and grabbed 4 but the bottom plate split in half. I called OS customer service, explained the situation, and offered to ship back everything I have for replacements for other customer orders if I could pick another set of dishes as a replacement and was offered *** for *** purchase *** as well as being 'advised' "there is no warranty on the dishes, they did not arrive 'broken' (I missed the hairline fracture inspection course) and I still had 3 dinner plates and 16 salad plates and the *** could go for another set of dishes"---when the original set cost *** ----So please DO NOT BUY THESE DISHES and OS has lost me as a customer. I am still wondering how OS can take this policy when 13 dishes have broken/split per my pictures (I can post the other 11 dishes because I took pictures of them ALL) between Mar 3- May 3 2017---BEST*** I HAVE EVER SPENT!!!!!!!! I brought this set because I wanted something different. I love the two-tone color, this matches everything in my house. I love the ridges on the plate, it gives a different fill, than the traditional plain plates. The size of the plate is substantial, but not overly large. The design and color of each piece is wonderful. I am waiting for a sale to add a second Service for 4. One note, however, is that the circular ring at the bottom of each item (which supports and raises the item from the table) is somewhat rough and requires sanding with an appropriate material. Kudos, that they warn you about this in the packaging. LI ordered 2 of these. There were bowls and dinner plates broken in each box. 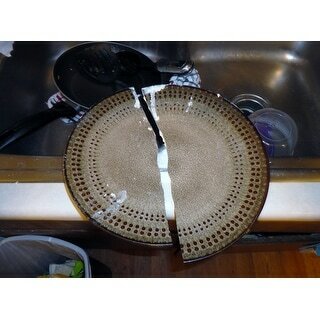 2dinner plates broke in dishwasher. Warning, very delicate. I purchased this set for everyday use. I was pleased with the weight and quality of the pieces. The color is rich and pretty. I am very happy with my purchase. Just as pictured. 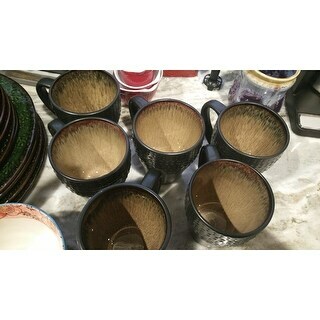 Very nice set of dinnerware for price. Planning to order another one, to make 8 piece set. I don’t love these plates. They are very concave causing food to gravitate towards the middle. If you are eating something with a sauce or gravy it pools in the middle of the plate. Wouldn’t get these again. one bowl was cracked and they wanted the whole set back so we decided to just deal with it. Great price & quality. Bought two sets and had no issues with them at all. This dinnerware is unique as it is pretty. Absolutely well made. 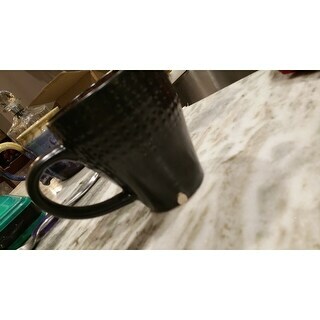 You feel great eating on it. The earth tone color and contrast are so vivid. Beautiful selection, great price! Pretty dishes but the bowls are not consistent in their design and color pattern. I had 1 plate chipped coming out of box. This is a beautiful set. I only use it to decorate the table. We’ve used the bowl once and it held up fine in the dishwasher. Beautiful designs. I am very pleased with these dishes. The color is very intense and beautiful brown/bronze color. The plates are on the large side but they are exactly as pictures on site. "Are there any other matching pieces I can buy separately? Such as serving or pasta bowls"
No, additional matching pieces are not available. Yes but not here. You'll need to search online. "Can I just buy the plate for restaurant, without bowl n cup"
Unfortunately no, these are only sold as a set. "Is this set a matte finish or a shiny finish? I am asking because I just returned 2 sets of this because the finish was shiny & the color was more tan/brown & uniform.....the photo really looks flat/matte. The picture also shows some Red tones. I just shipped back 2 sets of this because it was not as pictured & Im thinking maybe I just got shipped the wrong set altogether??? All reviews except mine rate this a 5.....I want to try & order again but really want a more rustic matte finish/texture with those subtle red tones... can you double check??? Thanks!!!" It is shiny but I don't see no red tones in it. The colors are more muted and dark. The matte look comes from the black on the bowls which is sort of flat. The set is very shiny. The colors are painted in what looks like a mineral type paint and they are more vibrant depending on the light. I see SHADES of purple and red (sort of mahogany red, so I can see why you felt it looked brown). I agree that the photos look like the bowls are pretty red/purple. In fact, I bought purple placemats to go with these and have to return them. I did notice, though, that the dishes do pick up hues from what they are placed on. So maybe if you had a deep red or maroon placemat, the red shade would be more obvious. For certain, the finish is very shiny although they look awesome with our eclectic rustic decor. Hope this helps. "Are these plates oven safe. If so to what temperature." "Do these have a lip around the edges?" Unfortunately, the information you have requested is currently unavailable. You will receive an email notification once an answer is posted. Have a great day. No they don't - the dishes are stoneware and are somewhat thick so they don't have a ridge . they have a slight upward slant to the shape. So the edges do not lie flat on the table. Actually they are pretty ordinary looking? I bought them for everyday use.. Hope this helps. While they have a noticeable curve (the top of the plate edge measures 1.5" from the surface), they do not have a lip on them. "What are the dimensions of the dinner plates?" Hello dsgill, the dinner plate is approximately 11.5 inches in diameter. Thanks for shopping with us! 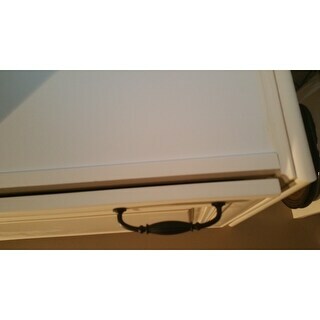 NOTE, as stated in my review, at 11.5" these will not allow the cabinet door to close on a standard sized cabinet. "Do these get hot in the microwave?" Hello sandykl, this item is microwave safe. Please feel free to contact us again with any further questions. Thank you for shopping with us!